This has become the archetypal and definitive repertory. Kent attempted to pull together all the repertories that were in existence at that time. After several years of work he realized that there was no way to bring together works which approached the subject from so many different points of view. He abandoned that project and started again - this time with the original provings and information gathered till that time. The work existed as an interleaved book in the office of his Post-graduate School. His student asked him to make it generally available. It was issued as one section at a time. Originally it was printed in 12 fascicles, sold individually as they were compiled and printed. 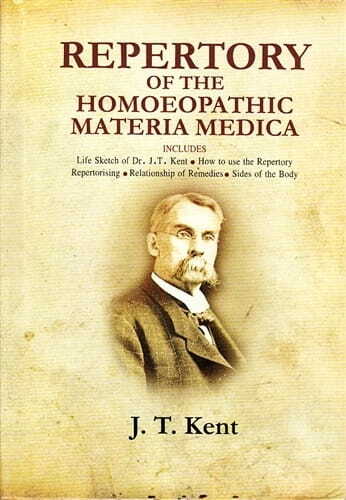 It was the repertory that is still in use today by homeopaths the world over. The second edition (1380 pages) was printed in 1908; the 3rd edition (1423 pages) was printed by Ehrhart and Karl in 1924. Kent said, "The third edition completes my life work." It was proofed by his wife Clara Louise Kent, MD. All subsequent editions were printed by Ehrhart and Karl. The 4th edition was issued in 1935; the 5th edition in 1945; the 6th edition in 1957. There were no changes made in the content after the 3rd edition. Ehrhart and Karl printed one of the editions on "Bible Paper" allowing its thickness to be reduced from 2.5" to a bit less than 1.5". The book came in a slipcase. Henry N. Williams has the only copy of this edition I have ever seen. In 1930, a young Elizabeth Wright, spoke to the IHA about "Revamping the Repertory" outlining some of the shortcomings of the work. These were the faults she saw with Kent's work: Many rubrics are out of place - pulse is under generals instead of being with the heart, lips are under the face instead of the mouth, etc. There is no section for circulatory system, glandular system, lymphatic system, or nervous system. Pathological, diagnostic, and objective symptoms are scattered throughout. They should be in a separate section. Many common symptoms (such as vomiting, restlessness, etc.) are so large as to be useless. Repetitions abound. They should be cross-referenced. There are many more remedies that need to be included. Confusion over the rubrics being "aggravated from" whereas "ameliorations" are clearly mentioned. Many rubrics could be eliminated as being useless. Lack of an index and good cross-referencing. She proposed working on a new, abridged edition which would, she hoped, be printed on bible-paper and bound in two small volumes like the Boericke Book - the first volume being Generals the second Particulars. It is of note that George Royal commented when he asked Kent why he had not provided an Index, Kent replied, "A man with brains won't need it." Many of Wright's ideas have finally been implemented in the Complete and Synthesis Repertories - but the books have become larger instead of smaller as Wright intended. Reprinted from 'The Heritage of Homoeopathic Literature' with the kind permission of Julian Winston.